Dimensions 1.25 by 5.25 by 5.75 in. Amazon.com description: Product Description: #1 NEW YORK TIMES BESTSELLER â¢ David Brooks challenges us to rebalance the scales between the focus on external successâârÃ©sumÃ© virtuesââand our core principles. With the wisdom, humor, curiosity, and sharp insights that have brought millions of readers to his New York Times column and his previous bestsellers, David Brooks has consistently illuminated our daily lives in surprising and original ways. In The Social Animal, he explored the neuroscience of human connection and how we can flourish together. Now, in The Road to Character, he focuses on the deeper values that should inform our lives. 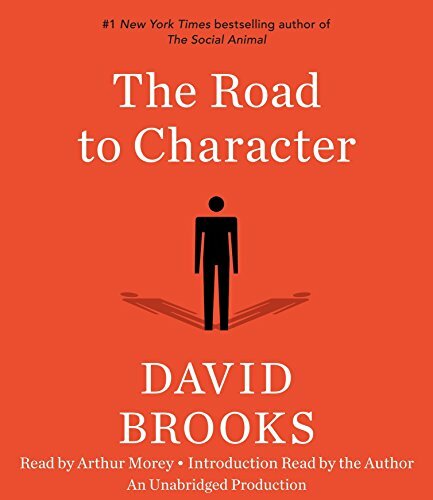 Looking to some of the worldâs greatest thinkers and inspiring leaders, Brooks explores how, through internal struggle and a sense of their own limitations, they have built a strong inner character. Labor activist Frances Perkins understood the need to suppress parts of herself so that she could be an instrument in a larger cause. Dwight Eisenhower organized his life not around impulsive self-expression but considered self-restraint. Dorothy Day, a devout Catholic convert and champion of the poor, learned as a young woman the vocabulary of simplicity and surrender. Civil rights pioneers A. Philip Randolph and Bayard Rustin learned reticence and the logic of self-discipline, the need to distrust oneself even while waging a noble crusade. Blending psychology, politics, spirituality, and confessional, The Road to Character provides an opportunity for us to rethink our priorities, and strive to build rich inner lives marked by humility and moral depth. About: A #1 New York Times Bestseller Responding to what he calls the culture of the Big Me, David Brooks challenges us, and himself, to rebalance the scales between our “résumé virtues” ― achieving wealth, fame, and status; and our “eulogy virtues” ― kindness, bravery, honesty, and faithfulness. With Pat Warren | from Harlequin Books (April 1, 2001); titled "The Way We Wed"
About: THE AGENT: Jeff Kirby, M.
With Timothy Mo | Reprint edition from Faber & Faber (April 1, 1988); titled "The Monkey King"
Unabridged edition from Random House (April 14, 2015); titled "The Road to Character: The Humble Journey to an Excellent Life"
About: #1 NEW YORK TIMES BESTSELLER • David Brooks challenges us to rebalance the scales between the focus on external success—“résumé virtues”—and our core principles.